I recently read an article about a group of people who call themselves "preppers." They are dedicated to being prepared for just about anything. I'm not talking about having a few Costco-size cases of toilet paper and soup in the garage...I'm talking about dedicating entire rooms, basements and sheds to stockpiling a year or more's worth of food and other goods in case of emergency, natural disaster, etc. Based on what I read, I guess I could call myself an anti-prepper. Not because I dislike preppers (although the gun-toting ones scare me a little), but because I've recently made it a goal to keep my refrigerator and my pantry as bare as possible. Why? Because because it keeps me from wasting food, and consequently saves me a lot of money. I do buy food regularly and my family eats a LOT. But I've made it a point to try and use up what I have before buying more - and I think it's really helped cut costs. Before I adopted the "bare is better" approach, I was constantly discovering food that I'd forgotten about until it had wilted or grown fuzz; or noticing that I had 7 jars of mustard, but no ketchup; or opening a brand new jar of pasta sauce when I had already had a 3/4 full one in the fridge. Out of frustration with my disorganization, and a desire to stretch my food dollars, I decided to get organized. As a result, I no longer waste money on products I already have, or throw away perfectly good food that I would have eaten if only I'd noticed it in time. Here are some of the steps I've taken to de-clutter my fridge and pantry. 1) Cut down on condiments and/or relocate them. It's amazing how full a refrigerator can look without having any "real" food in it. For some reason, people have a really hard time parting with something in a jar - even if it's some strange sauce they bought ages ago and didn't like that much. Go through the fridge and take a tough love approach with all those bottles of salad dressing, sauces, and other assorted things. Even better - if you happen to have a second fridge in the garage or basement, move all of your lesser-used condiments to that fridge to free up your main fridge for fresh foods. Once the fridge and pantry are organized and de-cluttered, it's easy to look in and quickly assess what you have a lot of and what you need more of. And when you can plan meals around the foods you already have in abundance, it means less things you'll need to buy at the store (and consequently less money you'll need to spend). Right now I happen to have a lot of parmesan cheese and eggs. So maybe I'll make some sort of cheesy frittata for brunch over Easter weekend. 3) Use up what you have before you buy more. Instead of making lots of little trips to the grocery store throughout the week, I've started making one or two really big trips once every 1-2 weeks. Then I try to be as creative as I can with the stuff I bought in order to make it last as long as possible. This sometimes gets frustrating, but most of the time it's kind of fun. It forces me to think outside the box. Almost anything sweet and/or nutty can be thrown into pancake batter. Smash up some overripe bananas, use up the last bits of applesauce, or toss in too-soft blueberries or crushed nuts. The other day, I even crushed up some stale gingersnaps in a batch of pancakes and they turned out great! Now I'm contemplating using our leftover peanut butter girl scout cookies to make some peanut butter banana pancakes...yum! Just about any cooked veggie, meat or cheese can be added to eggs and made into frittatas, omelets, scrambled eggs, or breakfast burritos. Since Sydney can't have cheese, we often make our own pizzas at home using store bought frozen or refrigerated dough. For toppings, I'll chop up leftover meatballs, sausage, veggies, or even deli meats. Leftover broccoli and sliced up deli meats can be mixed into pasta salad...leftover noodles can be tossed with tuna salad. Or a simple cappellini can be mixed with some steamed shrimp, olive oil, white wine, lemon, salt, and parmesan for an easy dinner that tastes elegant. 4) Plan weekly meals around "families" of ingredients. For me, one key to saving money has been focusing less on following exact recipes and instead creating my own simplistic (but tasty) meals. The problem with using recipes is that you often end up buying ingredients specific to that recipe, and then only using a portion of those ingredients and wasting the rest. I have bottles of spices in my pantry that probably cost $5 and that I only ever used in one dish. To avoid this, I try to buy ingredients that go together and then use them in several different dishes throughout the week. For instance: if I buy tomatoes, basil, mozzarella, garlic and onions, I can use those ingredients in homemade pizzas, a caprese salad, bruschetta, pasta, or pasta salad. If I buy tomatoes, cilantro, onions, garlic, peppers, and shredded cheddar cheese, I can use that in a variety of mexican-themed meals throughout the week. I still waste food from time to time - it's inevitable. But I've definitely limited my wastefulness quite a bit. Now I rarely throw out food unless it's one of my cooking experiments gone bad, or an overabundance of red beets from one of my bountiful baskets. Being less wasteful feels good on three counts: I get to be creative, I'm saving money, and I'm being "green." I just won't be the one to turn to if disaster strikes...hopefully one of my neighbors is a prepper! I'm an anti-prepper. Of course, right now all I have in my fridge is Diet Coke, hot dogs, mayonnaise, and ketchup, so maybe I take it to an extreme. Wow... I like this idea!! 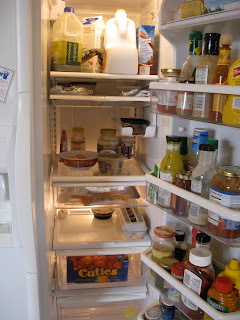 right now I am neither the prepper or anti prepper i am the fridge is full but there is no food in there! Cause it is either spoiled and need to be pitched or i have no idea why it is in the fridge cause I can't make anything with it. I wish I had half your creativity!! Well Lyss, I did try to eat all those Peanut Butter Girl Scout cookies while you were gone.........I should have tried harder. No wonder I didn't lose any weight this time. What a great reminder! And also reminds me to start using all the stuff in the basement freezer... I'm a bit afraid of what I'll find in there.